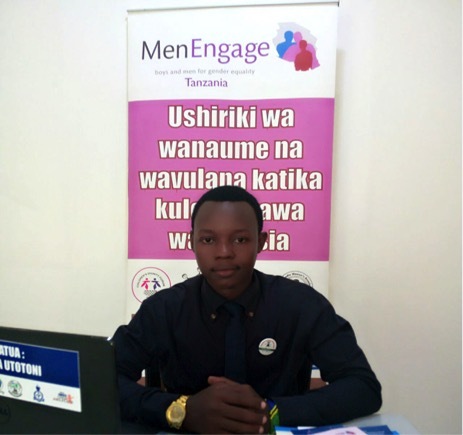 A warm welcome to MenEngage Tanzania’s new co-ordinator! We are very excited to extend a warm welcome to Michael Jackson into our fold! Jackson holds a Bachelors Degree in Sociology and Philosophy from the University of Dar es Salaam, and he has now joined the Secretariat of MenEngage Tanzania, Children’s Dignity Forum (CDF), as the Communications, Partnerships and Advocacy Officer – a role in which he will also be responsible for co-ordinating the activities of MenEngage Tanzania. He brings with him four years of experience working with community development and human rights organisations, including Art in Tanzania, Save the Children and Children’s Agenda Coalition. His areas of interest and expertise include children’s rights, sexual and reproductive health, gender equality, youth empowerment, research, policy advocacy, training, communication and partnership. His work has seen him develop several strategies focusing on communications and advocacy as well as media plans. Michael Jackson, we welcome and wish you well in your new role as the coordinator of MenEngage Tanzania. We encourage all our network members to join us in extending a hearty welcome to our new colleague and drop him a note at Michael@cdftz.org. For more on MenEngage Tanzania, visit them here http://menengage.org/regions/africa/tanzania. Finally, thank you to Dorothy Ernest, who previously filled this position. We are grateful for her sterling and tireless efforts and contributions towards building the MenEngage Tanzania network over the last few years. However, Dorothy is not lost to our cause. She has moved to CDF’s Monitoring, Evaluation and Learning Department where we will still notice her contributions to our work with men and boys to foster a culture that upholds gender equality and transformation in our societies. So, congratulations on your new appointment, Dorothy!